Pure white 10-12 in. erect conical flower heads apear in early summer on this beautiful plant. The blooms turn light pink as they age on this trouble free Paniculata. 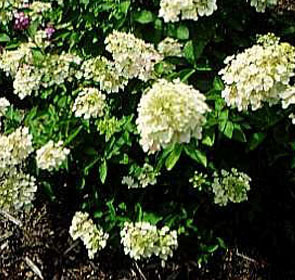 The color is spectacular in the fall with a mixture of white and pink flower heads against multi-colored leaves. These hydrandeas are grown in tree form and are shipped with stake to be used the first or so. They are shipped in containers with soilless media and a 9 month slow release fertilizer.